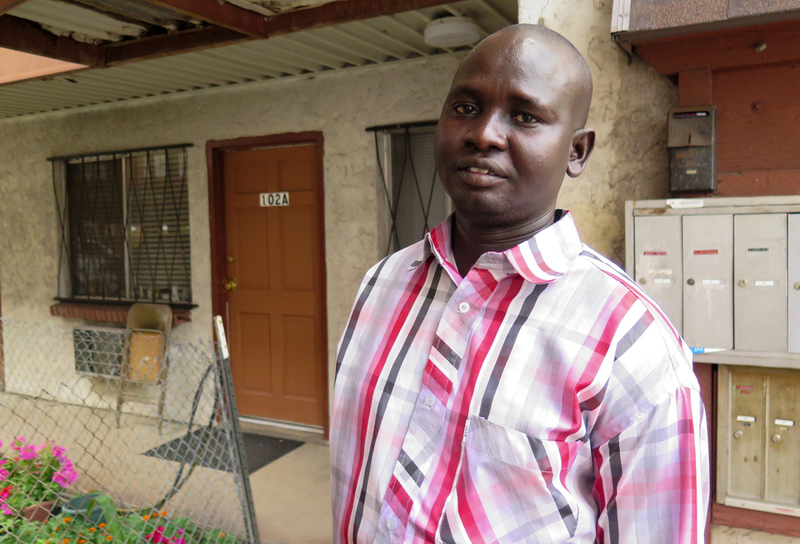 He Fled Sudan And Made A New Life In The U.S. So Why Go Back? : Goats and Soda Daniel Majok Gai became a "Lost Boy" at age 6 and eventually made it to Denver, where he managed a hubcap business and earned a college degree. Now he's determined to help heal his troubled homeland. Daniel Majok Gai revisits the two-bedroom apartment in Denver where he lived with seven other Sudanese refugees in 2001. Daniel Majok Gai wants to go back to South Sudan. He thinks he can help his homeland — the youngest nation in the world. Today marks the fourth anniversary of its independence. But there's little celebration. The country is being ripped apart by civil war. Yet Gai, who suffered through years of violence and pain as a refugee, believes he can play a role in moving South Sudan toward peace and safety. Against all odds, the 34-year-old is an incredible optimist. He was 6 when a militia attacked his village. "My father, who was out there in the field, tried to look for our cattle. They came and attacked the home. I ran in a different direction that I was not even know. So, from then, I never return home." He just kept running. For miles. And days. He became one of Sudan's famous Lost Boys — children of war who fled alone. Gai spent 14 years on his own, mostly in refugee camps. Then, when he was 20, news arrived at his camp in Kenya. "There was a bulletin board that take only 90 [names]. And when you see your name, you're knowing that you are flying to Nairobi, and Nairobi to wherever you are taken. A friend of mine came and said, 'Hey, Daniel, you are leaving on the second of September.' I said, 'You're kidding.' I came, and it was Daniel Majok Gai there on the board. I look at it closely, and it says you are going to Denver, Colo."
Last week, Morning Edition host David Greene met Gai in Denver. Kevin Leahy and David McGuffin of NPR were there as well. Gai took them to the apartment where he stayed when he arrived in 2001. "So we were all living here, eight of us living here," Gai explains. It's a simple concrete block building across the street from a car wash. He remembers how a refugee agency suggested four to an apartment. "I said, 'No, I don't like that,' " because he really wanted to live with the other Lost Boys he'd grown up with in the camps. "We were living in one bedroom, eight of us, no matter what. We don't need your mattresses, we don't need your beds — we can sleep on the floor." For Gai, things seemingly as simple as grocery shopping were bewildering. "Going to the store, you see these good meats around, but there's no cow. Where does it come? Is it actually really a beef?" He laughs. "And where is that cow? We've been here in town for almost a month and we don't see cows." Gai likes to laugh, but in fact he's a driven guy. "My first job in America was for a company called Hub Cap Annie." He took selling hubcaps very seriously. He asked Annie, the owner, for homework. He wanted to study the catalog. "I'll take it home with me tonight," he remembers telling her. He spent seven hours cramming every picture from the book into his brain. After a week, he could identify 80,000 hubcaps. "I crammed it all." Gai went on to manage Hub Cap Annie. He earned a B.A. in psychology from the University of Colorado in Denver. He became a U.S. citizen. An aid group was able to track down his family. He hadn't seen them since he was 6. His mom, brothers and sister joined him in Denver. But his father, whom Gai last saw years ago, trying to save the family's cattle as the village was being attacked, wouldn't come to the U.S.
Gai desperately wanted to see his dad. In 2010, nine years after arriving in Denver, he worked with Project Education Sudan to get back to his homeland. "Your father might not know you," the staff told Gai. He replied, "I might not even know my father." He'll never forget landing at the dirt airstrip, walking down the steps of the plane and seeing a man off to the side, alone, in a cowboy hat. "Something in me was like, that old man there is your father for sure. He was so serious, he was just looking at who was getting out, and the moment I get out, the tears dropped in my eyes, I just cried. He just came down there, you know, like coming so hard to me. I ran to him and we grabbed each other." "The first thing he said was like, 'You look like my son,' and I said, 'You look like my father.' "
"I'm back home to my town, my father is there. I felt like I'm born again." His father's determination to stay in South Sudan brought out that same resolve in his son. Gai moved back to the country in 2011 and worked for a Denver-based aid agency that builds schools. He married and had a son. And he was there four years ago when South Sudan declared independence. But soon, history repeated itself — for Gai and his country. Gai was in his village, with his wife and newborn, and his elderly father, when rebels attacked. Just like when he was 6 years old, he and his family started running. They hid in the swamp for more than a week. "My son got sick, terribly ill. He had dysentery, diarrhea, vomiting." And then there was this scene in his village. "I managed to come back, on the following days. The bodies were still dying and the dogs were feeding on the humans." Gai was able to get his family to safety in Kenya. His baby son survived. For a year or so, the family has been in Nairobi — and Gai now has a newborn daughter. He's determined to move them all back to South Sudan. Gai is running the aid agency he was working for: Project Education South Sudan (the name changed when South Sudan declared independence). That's how we caught up with him in Denver, working with the group to prepare for his return home. It'll be a difficult return. Anthony Lake, the executive director of UNICEF, said the worsening violence against children in South Sudan is unspeakable. "Survivors report that boys have been castrated and left to bleed to death. Girls as young as 8 have been gang-raped and murdered; children have been tied together before their attackers slit their throats. Others have been thrown into burning buildings." "When I read that, and I have read it over and over again, it's not new to me," says Gai. "It is something that I have witnessed. When I left home at gunpoint, this was what was going on." But he is determined to go back: "I want to help the country." Gai feels the place where he can do the most good is South Sudan. He feels the same drive that led him to successfully manage Hub Cap Annie could be used to save lives and rebuild communities. "That's why I choose to go. I will live in Bor; my family will be safe." "I know that because I've been there," he says. "I just came last month from there. I sleep there. I eat there. And I work there during the daytime. So I'm safe. I'm not 100 percent, but I say, yes, I'm safe." I'm not 100 percent, but I say yes, I'm safe. Yet he is well aware that a positive attitude won't solve South Sudan's problems. "For me, I think democracy doesn't come without violence." The tensions between the two warring ethnic groups — the Dinka and the Nuer — can be felt in the South Sudanese diaspora, including in Denver. At a coffee shop in the bohemian neighborhood of Five Points, Gai meets with Gatwek Deng, a South Sudanese refugee who arrived in Colorado the same year Gai did. Gai is Dinka, like the country's president. Deng is Nuer. Deng says his people don't trust the government. The two men go back and forth for two hours, arguing over which political leaders are at fault. Afterward, Gai appears shaken up. And he sounds more desperate than ever to get to South Sudan and help. "I think it is time now for us," he says. "There is no other time."